George K. Najjar granted International Educator of the Year award by the world’s flagship organization in international business research and education. Provost Najjar receiving his award. LAU provost George K. Najjar was named International Educator of the Year by the Academy of International Business (AIB), the world’s flagship organization in international business research and education since 1959. 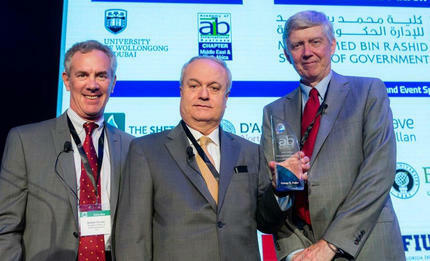 The provost accepted the award at the AIB annual conference held in Dubai last month. “The selection process for this award is most rigorous and the award itself highly prestigious,” said LAU President Joseph G. Jabbra, offering his heartfelt congratulations to the provost in an open letter to the LAU community. As such, says Najjar, “this award recognizes LAU as a major center of business education and is a reinforcement of the already considerable stature of the university as an academic powerhouse.” LAU trustee and President of Northeastern University in Boston, Joseph E. Aoun is among previous recipients of the award. After a long career as Vice President and Founding Dean of the School of Business at the American University of Beirut (AUB), Najjar joined LAU in 2012. The successful implementation of the university’s second strategic plan and development of the third strategic plan are among the recent achievements he is most proud of. “We have upgraded our research profile, invigorated existing graduate programs and introduced new ones, and built an excellent network of partnerships and links with major organizations within and beyond the region,” he says. “We are building on past strengths and surging ahead to new heights,” he adds. While he enjoys it tremendously, and is the recipient of several teaching excellence awards, Najjar’s responsibilities as provost do not leave him with much time to teach. However, he has been conducting various studies that focus on the changing landscape of business education in the region, tracing its metamorphosis from the early 1980s to the present day, with consideration of the imminent trends that will shape it over the next 20 years.